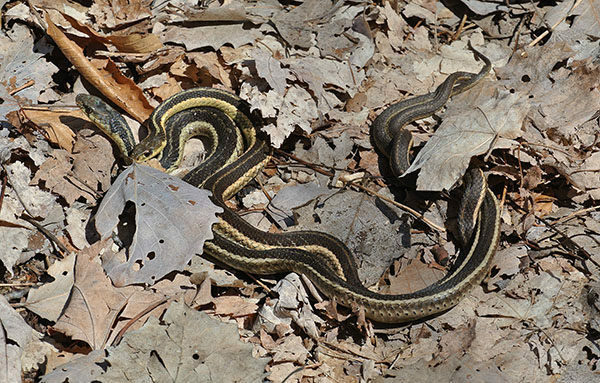 At 342 acres, Houdek Dunes is Leelanau Conservancy’s largest and most diverse preserve. 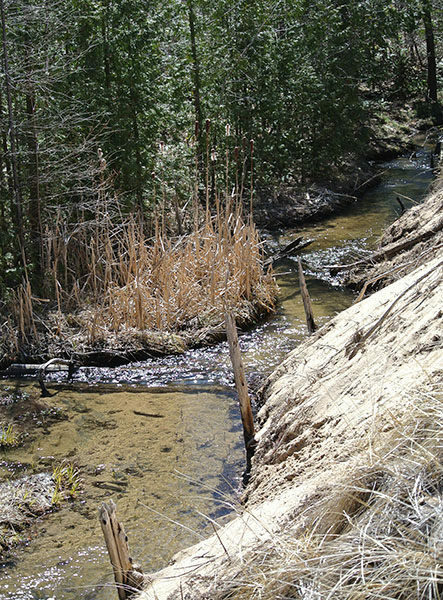 The landscape ranges from hardwood forests featuring some of the largest white birch trees in northern Michigan to Houdek Creek, a spring-fed trout stream and the primary tributary flowing into northern Lake Leelanau. Then there are dunes. These hills and mounds of sand are the result of glacial sediments being exposed 4,000 years ago when the ancient Lake Nippissing receded. The trails skirt active blowout dunes, cross stretches of open sand scattered with tracks and climb forested backdunes to views looking down. 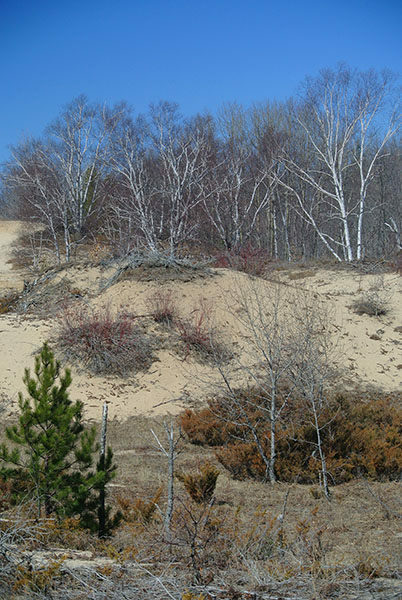 The dunes form a barrier between Houdek Creek and upland hardwood forests whose foliage include aspen and red oak along with beech and maple in the sheltered valleys. The woodland pockets, created by dips in the dunes, are also responsible for Houdek’s most noted trees; large, healthy white birches. Thriving in the narrow ravines and hollows that shield them from the wind, many of the birches are more than a century old, an age that is highly unusual for this transitional species. Portions of the preserve were logged more than a century ago and then farmed by the Houdek family. That agricultural past is still evident today in the form of remnant apple trees from orchards long gone and fence posts that indicate cattle grazing. Eventually the area was destined to become another golf course when the Leelanau Conservancy staged a campaign and acquired the tract in 1998 that included a mile of frontage on M-22 and 4,500 feet along Houdek Creek. The trail system at Houdek Dunes totals 3.5 miles with three crossover spurs with the perimeter trails making for a pleasant hike of nearly 3 miles. The hiking is considered easy to moderate due to soft sand and a few moderately steep slopes. The trail begins with a stairway of steps and from there continues as a path in a rolling forested terrain. Within a few hundred yards you reach the junction with the return of the Houdek Loop Trail, the first loop of the system and a hike of less than a mile. Head right. The bulk of the hike will be along the Forest Trail that is reached at the second junction at Mile 0.35 and begins in a lightly forested area of rolling dunes. Within a quarter mile the trail begins a steady climb that tops off just beyond the junction with the Crossover Trail at Mile 0.75. You to dip and climb through forested terrain reaching the next junction at Mile 1.3. Here Forest Trail continues south (left), you head west (right) along the Ridge Line Trail, skirting wooded hollows from above and climbing to the top of a small knoll. At 660 feet, or 76 feet above Lake Michigan, this is the highest point along the loop, high enough to provide a view of other parts of the preserve and a vineyard clinging to the side of a ridge in the distance. The trail immediately descends off the knob and continues along grassy ridgelines that allow you to peak into more hollows and wooded pockets at impressive birch trees. At Mile 2 Ridge Line Trail arrives at a posted junction and an octagon-shaped viewing deck that was built and donated by the Houdek Family. The view includes serene Houdek Creek gently flowing past a strip of grassy and open dunes. Nearby is a bench overlooking the creek under a shade tree, a most soothing spot for an extended break or lunch. The short Houdek Creek Trail heads west to return you to the Forest Trail on the edge of the preserve’s most impressive dunes. Head north (right) and soon you’ll be skirting a fine line with the open dunes on one side and forest on the other. At one point, blue-tipped posts lead you across open sand to the forest on the other side and at Mile 2.4 you arrive a junction with Crossover Trail and Houdek Loop Trail. Nearby a pair of benches are positioned in front of the “ancient maple,” a large, old and distinctively gnarly tree, looking like it belongs in the Wizard of Oz Haunted Forest. Follow the Houdek Loop Trail, a level path through the woods, and in a half mile you’ll be back at the stairways. There’s a bench at the top of the stairs. Take a break, no need to rush back into the summer traffic of M-22. Like most Leelanau Conservancy preserves, the Houdek Dunes trailhead has a small parking lot and an information kiosk but no source of drinking water or toilets. 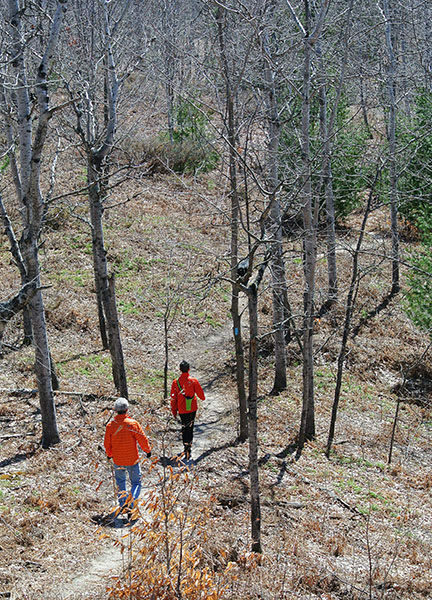 Houdek Dunes Natural Area is open year-round but in the winter is a favorite among cross-country skiers looking for a backcountry adventure on ungroomed trails. There are no fees for visiting the preserve. From Leland head north on M-22 and in 5 miles, or almost a mile past County Road 626, Houdek Dunes is posted on the left.